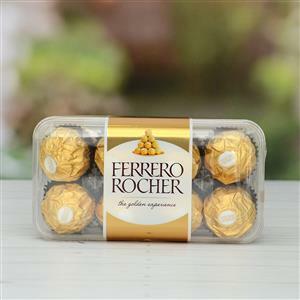 Send Palatable Ferrero Rocher - 16 Pcs to Chennai. Gifts to Chennai. Send Chocolates to Chennai. Description : This festive season send this mouth-watering 16 Pcs chocolates in a crispy and crunchy hazelnut exterior that individually wrapped for that freshness. Your dear ones in Chennai will surely love this palatable chocolates. The smooth and creamy soft milk chocolate piece is just breathtaking for the chocoholics! Order this along with other Gifts to Chennai through Gift2Chennai.com and make your loved ones feel extra special. Please Note : Picture is indicative. Box pack may not be available according to its availability.